San Francisco has long been one of America’s leading cities when it comes to furthering the craft of the cocktail. There are simply too many killer cocktail bars to name here and, as it is in my home base of Washington, DC, the list continues to grow. Smuggler’s Cove opened last year and I was able to make a visit there recently to sample their rum driven menu. Entering Smuggler’s Cove while the sun is up is a somewhat treacherous affair. The bar is very dark and coming in from the sun means you will be momentarily blinded while your eyes adjust. I’m not sure if this is intended to mimic the experience of walking below deck on a pirate’s galleon or not, but let’s just say that if that was the intent, it worked. To complement the spirit of the spirit, the bar is decorated in a heavy nautical theme – more ships and pirates than tiki accoutrement. 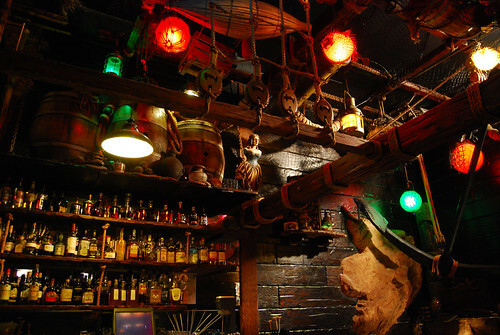 There are three floors and two bars in Smuggler’s Cove. It’s actually a relatively small and intimate space. There’s no table service, so all drinks have to be ordered directly from one of the two bars. Along with the biggest rum list I’ve ever seen, their menu includes seventy-seven cocktails that range from centuries-old rum drinks, to tiki drinks, to drinks from Prohibition Era Havana, to contemporary formulations of rum cocktails and drinks loved by different Caribbean islands. When it comes to classic rum drinks, there are a few favorites that I usually rely on to assess a bar or bartender’s dedication to making them well. For me, those drinks are the Mai Tai, Daiquiri, and the Hemingway Daiquiri. In this case, my pilot cocktail was a Mai Tai. It was made with Smuggler’s Cove’s own demerara blend and Appleton extra, along with lime juice and house orgeat and orange liqueur. The bartender, Steven Liles had absolutely perfect measurements and technique throughout the night. His Mai Tai was shaken with crushed ice that was poured directly, unstrained, into a tumbler. It filled it perfectly. The drink itself was pretty great. I like my Mai Tais with a real feeling from the orgeat and the version they used was heavily almond in its flavor. Beyond that, I thought there was good balance between the orgeat, lime, rum, and orange flavors. Next up was The Dead Reckoning, made with Private Reserve rum, pineapple, lemon, vanilla liqueur, maple, tawny port, Angostura bitters. It was topped with club soda and garnished with a lemon peel and what looked like a leaf from a pineapple, while served in a tall glass. The cocktail had a heavy maple and pineapple flavor up front. Combined with the vanilla liqueur, the maple gave a taste reminiscent of black strap molasses. The Dead Reckoning was very rich and not too tart despite the citrus elements. It was really a delightful drink – well balanced and an example of what it’s like when a tiki drink really works. Based on the recommendation of one of the staff, I tried the Pampanito, another tiki-style contemporary cocktail that was made with Venezuelan rum, molasses, lemon, allspice dram, Angostura bitters, seltzer and garnished with a lemon peel. It was definitely a strong drink that went heavily with the allspice and lemon. There was a nice effervescence, but the drink seemed to lack a noticeable rum or molasses flavor, making me think it was thrown out of balance by the allspice dram and the lemon. At this point, the thought of another tiki drink that was heavy on citrus juice and syrups made me ill. I’ve learned that while I really like tiki cocktails, more than any other genre it’s something that I have to take in moderation. Too much sour and sweet just fills me up in the way straight spirits and bitters never do. Smuggler’s Cove had one of my favorite Phil Ward cocktails, The Black Prince, on the menu. But I didn’t come all the way to San Francisco for a cocktail I know well back east. Steven suggested that I go with The Chadburn, made with Private Reserve rum, tawny port, pear liqueur, chocolate mole bitters. It was served up and, thank goodness, stirred! It was sweet in a rich way. The pear and the port worked with the burnt sugar flavor of the rum nicely, while the mole bitters added a little depth and complexity. It was a tad sweet for my tastes generally, but was a great break from all the citrus and syrup. I ended my night with the Demerara Dry Float. It’s listed on the site as containing “Exotic fruits, demerara rum, danger.” In fact it was made with El Dorado Demerara, two full ounces of lime juice, a dash of lemon juice, passion fruit syrup, maraschino and served with a sidecar of Lemon Hart 151 Demerara rum. It’s up to you what you do with the 151 – I choice to neatly pour it on top of the cocktail as a float, but apparently some people will opt to shoot it. Yikes. Despite the massive amount of lime juice, the cocktail was light. There passion fruit was strong and backed up with the lime. The drink finished with a nice thread of maraschino. It was a good drink and again, an intense example of why tiki can be really fun. I was very impressed with the polish of Smuggler’s Cove. From the detail work in their decorations, to the expansive rum collection, to their hand-crafted syrups and liqueurs, and well-prepared drinks, it was clearly a place that takes making craft cocktails very seriously. I don’t recall being as overwhelmed by the selection choices at a bar as I was at Smuggler’s Cove, so hopefully that means I’ll be able to go back soon and make more progress into their menu.